The Orioles traded their longtime closer Zach Britton to the Yankees for three minor league pitching prospects highlighted by former 2015, 1st round (4th overall pick) Dillon Tate. In addition the Orioles received RHP Cody Carroll and LHP Josh Rogers. Dillon Tate: The 24-year old righthander was once a prize draft pick of the Texas Rangers who selected him with the 4th overall pick in the 2015 draft. However, the Rangers quickly soured on Tate after he reportedly was resistant to their mechanical adjustments and he was packaged in a deal for Carlos Beltran. Tate has a fastball that can sit in the 95-97 mph range with life and a slider (86-88) that can flash plus at times. His changeup can be a solid offering as well though it his 3rd best pitch. The jury seems to be out whether he’s a starter long term or a potential closer, but most scouts seem to think he’s got a #3 starter ceiling. Cody Carroll: A 25-year old 6-foot-5 power right-handed reliever who appears to be major league ready after putting up a 2.38 ERA with a 11.9 K/9 K rate in 41.2 IP in AAA this year. He features a fastball that can sit 95-98 MPH (top 99) with a tight 86-89 slider that can miss bats and a splitter that acts like a split-change. His fastball doesn’t have great life, but he uses good plane and velocity to get batters out. He did not allow a home run all season. Josh Rogers – A 24-year old pitchability left-handed starter, Rogers has seen his K rate go down and BB go up in his first taste of AAA this season. With a fastball that sits in the 89-91 range, but his slider is his best pitch. He also features a change up, but the slider is a solid left on left breaking pitch which could mean a transition to the pen at some point. Tony’s Take: At first glance I like the upside of this trade with Tate being the crown jewel. 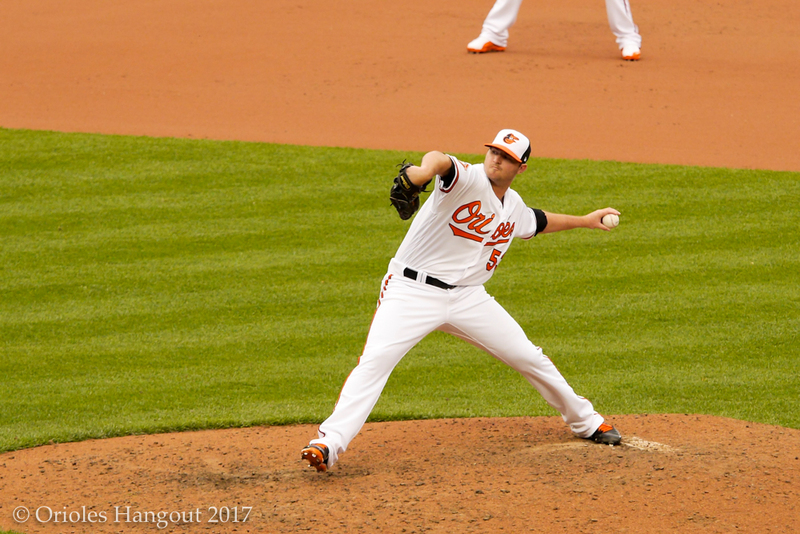 With an upside of a #3 starter and the floor of a back of bullpen reliever, there is long term value here for a two and half month rental of Britton. Add in a potential closer or at least a power reliever in Caroll, and the Orioles just may have found their Brad Brach replacement. Rogers is a guy who doesn’t have a ton of ceiling, but could end up a solid left-handed reliever or #5 starter if his change can become more effective against right-handers. Time will tell, and of course all medicals need to go through before this is final, but this looks like a good return for Britton.